Media companies are constantly looking for innovative concepts of effective advertising campaigns. Their purpose - to carry out the action in the most attractive format, creating a purposeful and broad product advertising presence. 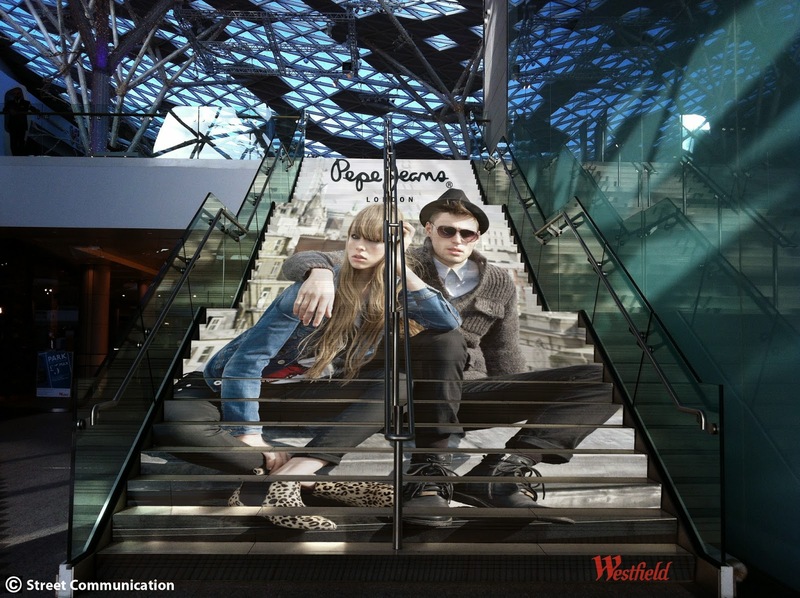 Advertising on the steps used to be a novelty, but now you can see it more and more often. 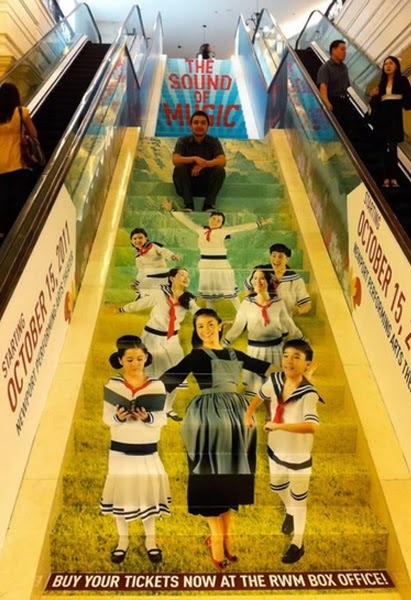 Resort Resorts World Manila has chosen a very interesting approach to promote the musical «The Sound of Music» («The Sound of Music"). She was placed on the stairs in a shopping center between the two escalators. Thus, people go shopping, always be aware of cultural events. 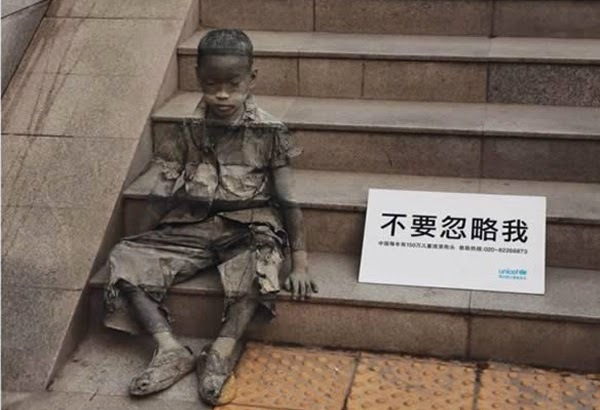 In 2008, the advertising company Ogilvy and Mather was commissioned to design an advertisement for the Shanghai branch of UNICEF. It was aimed at drawing attention to more than 1.5 million children living in extreme poverty in China, in spite of 30 years of continuous economic growth. Boy image is only part of a series of outdoor advertising placed around Shanghai. On the steps of underpasses depicted sitting on the stairs transparent ghostly child, dressed in torn rags. On the sign says: "Do not ignore me. In China, home to more than 1.5 million. Underprivileged children. " Impressive advertisement from National Geographic has a very realistic 3D-image of the crocodile. Optical illusion looks like a toothy beast is ready to jump out of the water and swallow passengers coming down the escalator in a shopping mall in Brazil. 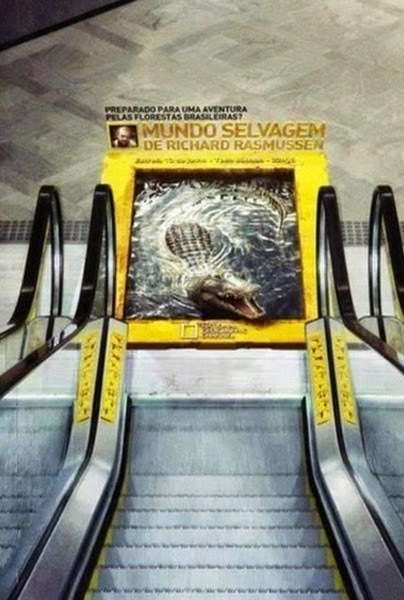 This is part of a campaign to «Mundo Selvagem de Richard Rasmussen», which translates as: "Ready for an adventure in the Brazilian forests? Wild World with Richard Rasmussen." 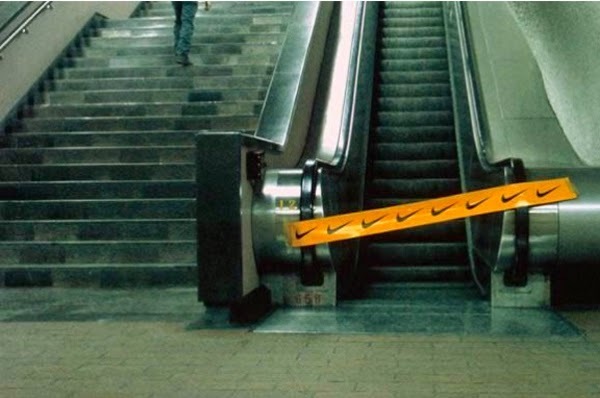 This ad deserves special attention. Its purpose is information about the need to reduce the use of plastic bags and replacing them with reusable bags. 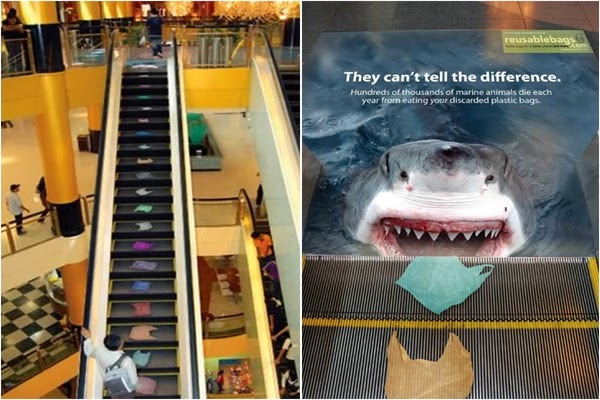 At the bottom of the escalator shown shark swallowing plastic bags. The caption reads: "They can not tell the difference. Every year, hundreds of thousands of marine animals die because of discarded plastic bags. " In 2012, the second consecutive year, the company "Turkish Airlines» (Turkish Airlines) has been named "Best Airline in Europe". 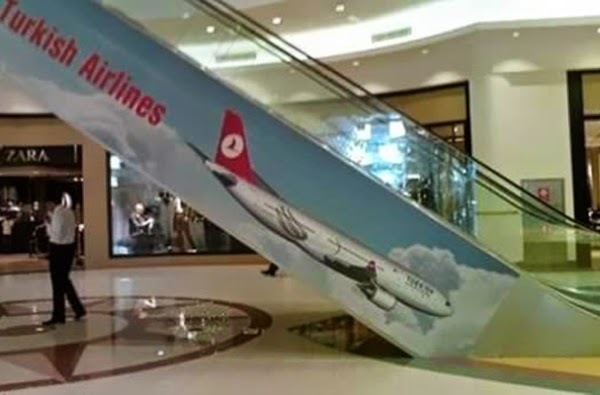 Unfortunately, the people responsible for advertising the company, do not fly with it! Unlikely they would have dared to take on board this aircraft. 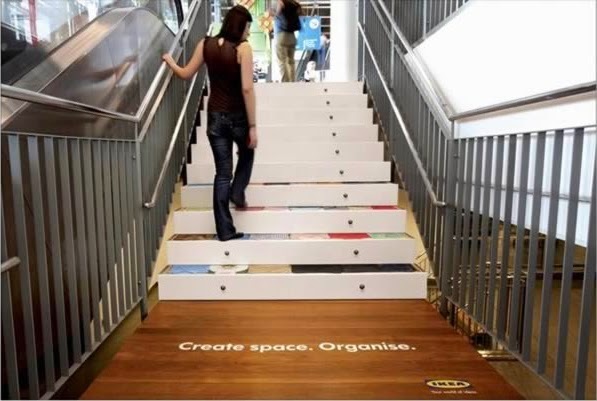 The company Ikea, a producer of furniture for storage, is characterized by using innovative methods to save space. To demonstrate this approach, the main staircase store is represented in the form of the chest, which neatly stacked things. 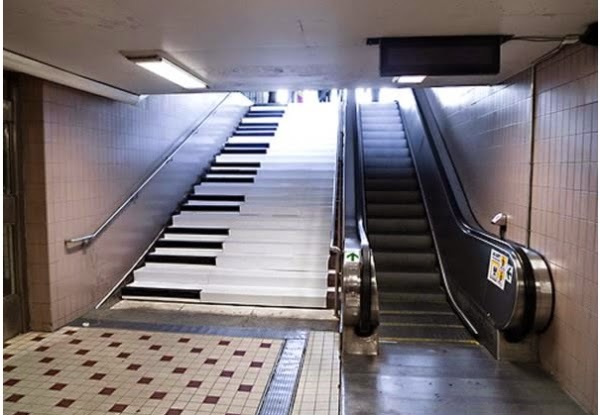 To encourage people to use the stairs instead of the escalator, stairs Odenplan Metro Station in Stockholm turned into piano keys. It should be noted that after such promotions by 66% more people are preferring stairs. Of course, each person has to worry about their health and maintain a healthy lifestyle. However stumbled on a promotional move from Nike's after a long day in high heels, you can very much become angry to the trademark. Company UpStares Media of Livingston, New Jersey in 2004, specializes in "ladder" advertising ". At each step placed some part of the overall picture, and when viewed from a distance, the strips together to form a complete picture. Quite often it may be a visual pun. 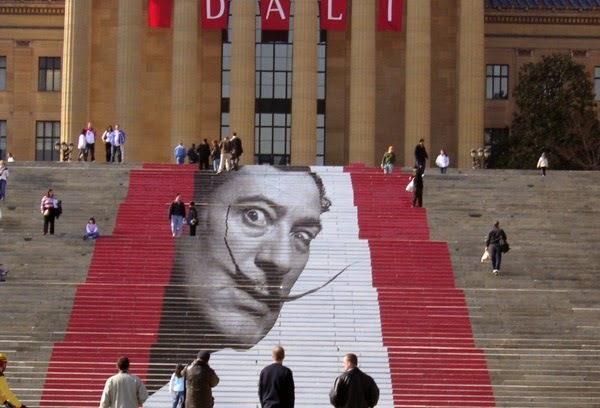 Here is a blurb Dali exhibition, located in the Museum of Art in Philadelphia.